This dense and delicious cake has a texture between fudge and a brownie. It has a hint of the Orient through the addition of ginger and cinnamon. A good keeper, it can freeze very well. Using a 9-inch round pan as a guide, cut out a 9-inch circle from the paper. Butter pan and place paper round in the bottom. Fill a medium pot 2-inches deep with water and set over medium-high heat. Place chocolate and butter in bowl, stir until melted, well combined and smooth. In a medium bowl, beat together eggs, sugar and ginger until thickened and pale in color. Slowly stir in the smooth chocolate mixture until well combined. Sift together flour and cinnamon and stir into chocolate mixture. Pour batter into pan and cover tightly with tin foil. Place pan into a large roasting pan, fill roasting pan with enough boiling water to come halfway up the side of round pan. Cover roasting pan with tin foil, enclosing round pan inside. Place in a preheated 350°F oven and steam for 1½ hours, or until middle of cake has set. It will still be very moist. Unwrap cake and let cool completely by placing it in the fridge. To ease removal of cake, run hot water over the base of pan to help loosen any solidified butter. 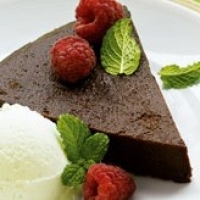 Slice into 12 portions and serve with ice cream, raspberries and mint to garnish. Wonderful flavors in this cake! Chef, I need some advice, when you use bittersweet chocolate, which one do you prefer: 90, 80 or 70%? Is there any brand you like more?